I love hosting Thanksgiving dinner. I get a lot of help from my family. Desserts and some sides and appetizers are brought in by various aunts and cousins and grandmas. 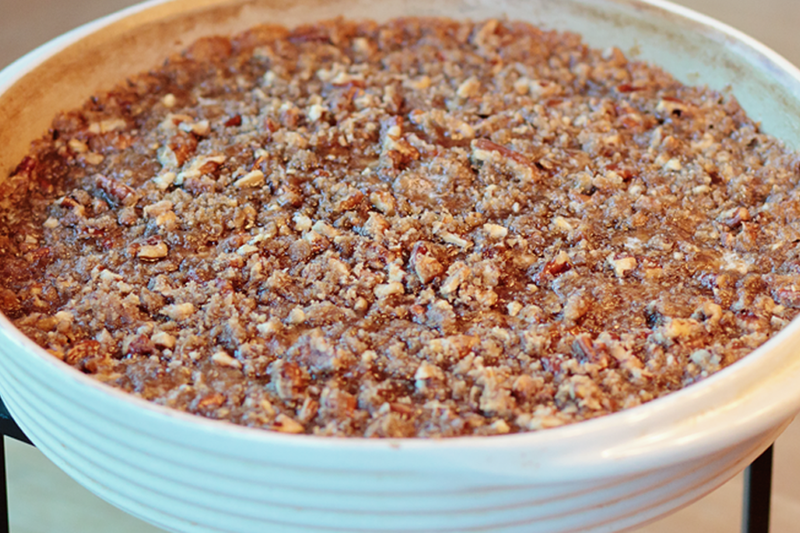 Pecan-crusted Sweet Potato Casserole is so a-MAZ-ing. Every year my uncle says it’s like putting a slice of pecan pie next to your turkey. The inspiration recipe came from my 1980 copy of the Eugene Junior League’s A Taste of Oregon . It’s a worthy addition to any cookbook collection…so full of great recipes that it tragically has no room for pictures. Preheat oven to 350ºF. Lightly butter a deep baking pan. I use a 9×9 circular stoneware from Pampered Chef. Put eggs in a mixing bowl and whisk. Add in sweet potatoes, sugar, vanilla and milk. Cut in butter. Mix ingredients until combined. Pour casserole mixture into a baking pan. For the topping, put brown sugar, flour, and chopped pecans in a mixing bowl. Cut in the butter and mix together to form a crumb topping. Sprinkle the topping evenly over the top of the casserole. Bake uncovered for 30 minutes and serve warm. Tip: For Thanksgiving I get this made early in the day. I set it out on the counter about an hour before the turkey will be done to get it to room temperature. When the turkey comes out, the Pecan-crusted Sweet Potato Casserole gets covered in foil and put in the oven to warm back up.